BRADENTON, FL. – The Ryder Cup matches have produced plenty of drama over the years, but one of the most memorable events in the competition didn’t involve anyone hitting a shot. It came in 1969 at England’s Royal Birkdale, in the final singles match between American Jack Nicklaus and England’s Tony Jacklin. Nicklaus conceded a two-foot putt to Jacklin, which resulted in their match being halved and the competition ending in a tie for the first time. Nicklaus’ gesture was considered great sportsmanship in some quarters, but not in keeping with the competitive aspect of the event according to others – among them some of his U.S. teammates. The debate has raged on as the Ryder Cup – staged last September at Medinah with Europe winning in dramatic fashion – taking its place among the most popular team competitions in all of sports. Fast forward over 40 years. Jacklin settled in this Florida community between Tampa and Sarasota and Nicklaus went on to do great things as a course architect while his playing career was winding down. That’s when their paths crossed again, for the building of The Concession – a dazzling but challenging course that will soon host an event of its own to further rekindle that Nicklaus-Jacklin moment from the past. This time it was Jacklin making the gesture, an effort to boost the image of a course that he designed in collaboration with Nicklaus. The new event is The Concession Cup, which is certain to become a nice addition to the world golf calendar. It’s in keeping with how the club was created in the first place. Jacklin suggested a course named in honor of Nicklaus’ famous concession. Nicklaus liked the idea and eight years ago The Concession was built with the two playing an exhibition match that drew several thousand spectators in January, 2006, as the highlight of its grand opening. While the layout is a “Nicklaus Signature’’ course, its scorecard notes that it was designed “in association with Tony Jacklin.’’ That was a concession on Nicklaus’ part, too. Jacklin found the land and would have been content if that was the end of his role in the course’s creation but Nicklaus didn’t want that. 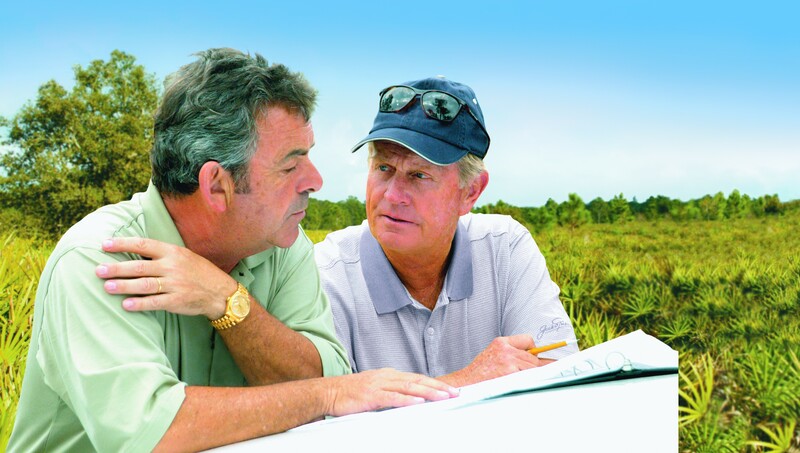 Jacklin (left in photo above) and Nicklaus made it a collaborative effort. The club has embraced the concession of ‘69 by using silhouettes of Nicklaus and Jacklin in its logo – one of the most striking in golf (pictured above) – and the two will be honorary captains at this spring’s Concession Cup, a new team event that will bring together the top mid-amateur, senior and super senior players from the U.S. and Great Britain/Ireland. Nicklaus’ courses are all super challenging, and The Concession is one of only 12 courses in the U.S. with a slope over 150. The 7,474-yard (from the back tees) layout has a slope of 155. It was built over 540 acres, an extremely large land usage for an 18-hole course. The course will complete a three-year agreement to host the men’s Big Ten Match Play Championship this winter and will host the NCAA men’s and women’s championships in 2015. It tried to land the LPGA’s Solheim Cup but was unsuccessful. The creation of the Concession Cup, though, will elevate the club’s profile and create a competition that might eventually be incorporated into the U.S.Golf Assn. schedule. The biennial match play competition will bring together the best mid-amateur, senior and super senior players from the U.S. and Great Britain/Ireland two weeks after the next Masters. There’ll be a practice round and opening celebration gala on April 29, a charity amateur event on April 30, nine foursome matches on May 1, nine fourball matches on May 2 and 18 singles matches on May 3. While the competitors on both teams won’t be announced for a few weeks, the U.S. team will include Nicklaus’ son Gary along with top amateurs Nathan Smith and Vinny Giles. Paul Azinger, former U.S. Ryder Cup captain and a Concession member, will be honorary chairman of the event and ex-PGA Tour player turned golf commentator Gary Koch will emcee the banquet. He’s a Concession member, too. Still seeking members, The Concession was named the Best New Private Course in the U.S. by Golf Digest in 2006 and its practice facility is one of the best in the world. Tour players Brittany Lincicome, Hollis Stacy, Sandra Gal, Dicky Pride, Scott Hoch and Andy Bean use it regularly and famed instructor David Leadbetter has declared The Concession his “home away from home.’’ He’s worked with his top players and given lessons there. In late January Concession Cup officials made their first player announcement. Vinny Giles (U.S.) and Garth McGimpsey (Great Britain-Ireland) will be playing captains. First players on the U.S. squad are Doug Hanzel, Savannah, Ga.; Chip Lutz, Reading, Pa.; John “Spider” Miller, Bloomington, Ind. ; Pat Tallent, Vienna, Va.; Paul Simpson, Raleigh, N.C.; Danny Yates, Atlanta; and George Zahringer, New York. First GB-I players named were Ian Brotherston, Maurise Kelly, Adrian Morrow, Arthur Pierse and Andrew Stracey.